SpaceX: Pad abort test video. The Dragon capsule floats over the Atlantic toward splashdown after the pad abort test. It was an almost blink-and-you’ll-miss-it event: SpaceX tested its “pad abort” system for the Dragon capsule this morning, with the launch occurring right on time at 09:00 EDT. Just before launch you can see the water dump, done to suppress fire and vibration damage from the sound. Then the eight SuperDraco engines fire, and holy wow does the capsule leave in a hurry! At T+15 seconds the lower trunk (which in a real flight supports the capsule on the rocket stack and would contain unpressurized cargo and the capsule’s solar arrays) disengages and falls away. 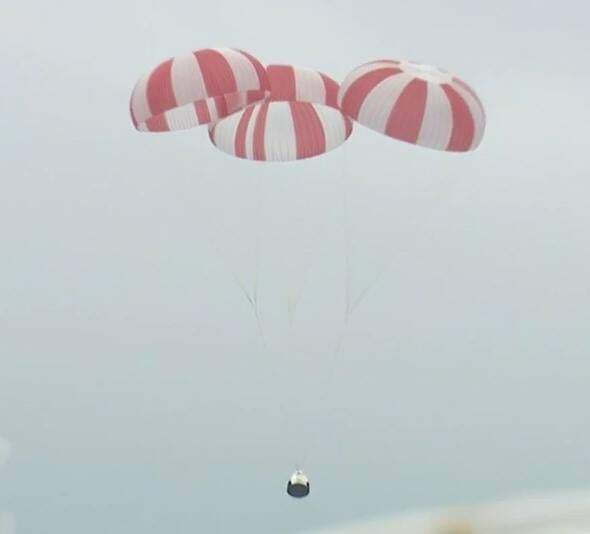 The capsule then flips nearly all the way over, and the parachutes release. That stops the near-tumble, and the capsule fell safely into the water at T+1:38. The test looked successful, and I have unofficial word it went as planned. After that, nothing. The capsule splashes down, but we hear no more official word. 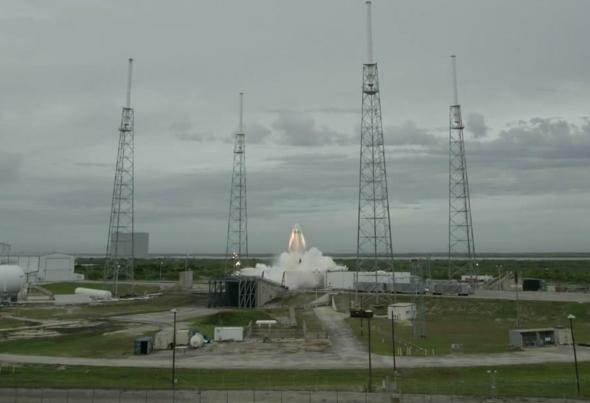 The powerful SuperDraco thrusters firing at launch. Photo by SpaceX, from the video. It’s too early to speculate over this, honestly, because again, to be clear, there is no official word yet. I’m awaiting the report from SpaceX and/or NASA on how everything went, and I’ll update this post when I hear more. Update, May 6, 2015, at 15:45 UTC: During a telecon after the launch, SpaceX CEO Elon Musk said that the test went well. Someone asked if there was a problem with the trajectory due to not enough thrust from the engines, and Musk replied that one engine was “very slighty” under thrusting, but that shouldn’t have much affect on the trajectory. He also said not all the data were in, and they’re looking over the telemetry. Personal note: I expect we’ll hear more about that soon, and hopefully more about the odd comments by mission controllers during the launch. Musk said the capsule accelerated from 0–100 mph in 1.2 seconds, which is just under 4 gs of thrust (four times the Earth’s gravity). He expects SpaceX will be able to take astronauts to the International Space Station in two years (plus or minus six months). 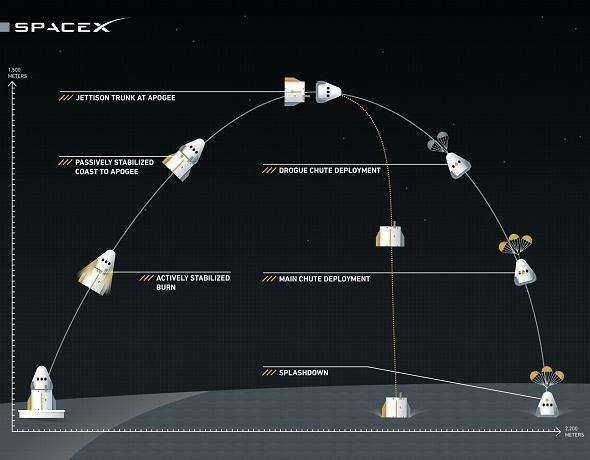 The predicted flight path of the Dragon test. It didn’t quite achieve these results; see text below. According to an earlier press release (see above graphic), the apex of the flight was supposed to be 1500 meters, so it didn’t get as high as expected (attaining 1187 meters). Also, it was supposed to splash down 2200 meters downrange, but only went about 1200 meters. At the time I noticed it appeared to come down closer to shore than I expected. It sounds like it didn’t thrust as hard and/or as long as expected, but again I don’t want to speculate until we hear more. For information on the background behind this test, please read my post from Tuesday. Correction, May 6, 2015, at 14:30 UTC: I originally misstated that the test went off at 07:00 EDT, but it was 09:00. It was originally set for 07:00.